can help you do all of these things. Just upload photos to your own Picasa Web Albums page, then embed a link to that album on your site. Because your photos will be stored on a Google server, you can let us worry about hosting your files while you concentrate on creating a great looking gallery that will enrich your site. After signing up and creating a web album, simply click the Embed in Blog/MySpace link in that album. Just like with AdSense, you'll then need to copy and paste the provided HTML into your site's source code. Republish your site, and the cover photo of that album will appear on your site, already linked to your web album. When embedding your photos, please keep the AdSense image guidelines from last month in mind. Your Picasa Web Albums account is free and comes with 250 MB of storage space -- enough room to store about 1000 photos (at 1600 pixels each). It's also possible to upgrade and order additional space (up to 250GB) as your photo storage needs grow. And unlike some other photo sharing sites, Picasa Web Albums retains the quality of your images so you and your site's visitors can download those same high resolution photos off the web and to their computers. Finally, you can now also upload video into any web album -- a nice touch to really make your content come alive. And while you can't currently customize the look of your Picasa Web Albums page to match your site, we hope you'll find that its clean, uncluttered look complements your site's design. Need help using Picasa Web Albums? Visit Picasa Support. As webmasters (and web users), you know that images can liven up text-heavy pages and help engage readers. Maybe you keep a personal blog and you'd like to share a holiday photo album. Or maybe you manage a knitting tutorial site, and you'd like to post photos with step-by-step captions. Well, Picasa Web Albums can help you do all of these things. 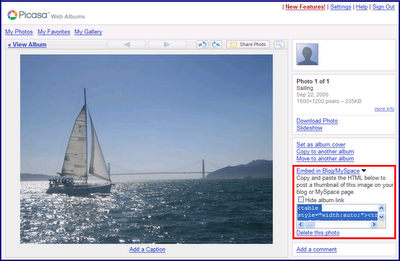 Just upload photos to your own Picasa Web Albums page, then embed a link to that album on your site. Because your photos will be stored on a Google server, you can let us worry about hosting your files while you concentrate on creating a great looking gallery that will enrich your site.